Operating at 360 RPM, our augers rotate much faster than competitive units. Built to last, it will get you through a lifetime of digging hard dirt. Post hole digger features a B&S Vanguard OHV engine with 8-inch solid tires. Auger not included. Our earth drills by Little Beaver are incredibly fast. Operating at 360 RPM, our augers rotate much faster than competitive units. Not only does this increase your drilling productivity, but it also results in cleaner holes. 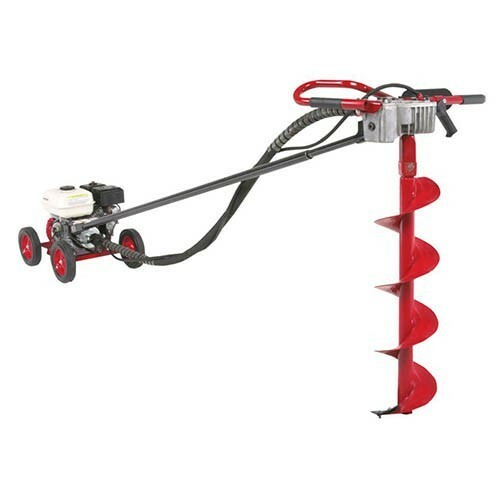 This is a great one man hole digger for so many different uses. Built to last, it is bound to get you through a lifetime of digging hard dirt. Applications include fencing, deck work, landscaping, sign erection, soil sampling, and horizontal boring. Post hole digger features a B&S Vanguard OHV engine with 8-inch solid tires. Auger not included.